Organic agriculture continues to develop dynamically in Europe. In most countries the organic land use is on the increase and the market continues to grow. This positive development is also due to several policy support measures; such as funding under rural development programmes, legal protection of the terms used to indicate organic products, action plans as well as support for research. At EU level the organic sector, is represented by the IFOAM EU Group an independent regional group of the International Federation of Organic Agriculture (IFOAM), which plays an important role in the further development of organic food and farming in Europe. Global turnover in organic food was almost 55 billion US dollars or approximately 40 billion Euros in 2009 (Sahota 2011). About one quarter of the world’s organic agricultural land (37.2 million hectares in total) is in Europe (which accounts for 9.2 million hectares) (Willer & Kilcher 2011). , 000 producers (Willer & Kilcher 2011). Between 2008 and 2009, the organic agricultural land in Europe increased by 1 million hectares. The increase is due to high growth rates in Turkey, Spain, Italy and France. In recent years, growth rates were higher in the new member states compared to those in the EU 15. The country with the largest organic agricultural land area in 2009 was Spain with 1.3 million hectares, followed by Italy with 1.1 million hectares, with Germany in the third place (with more than 1 million hectares in 2010). The country with the highest number of producers is Italy (more than 43,000 producers). In 2009, the organic food and drink market (general retails sales, specialised shops, farm gates sales etc.) was estimated to value approximately 18, 400 million euro. The largest market is Germany with approximately 5.9 billion euro (2010), followed by France (approx. 3.3 billion euro in 2010), and the UK (approx. 2 billion euro in 2010). Denmark, Austria, and Switzerland account for the highest market shares with more than five percent of the total food and drink market. While land area under organic management has expanded rapidly in many new EU member states as well as in candidate and potential EU candidate countries, consumption levels have remained low in these countries (less than 1 percent). Whereas 2009 was characterised by slower growth than the previous years, with stagnation in some countries, the situation has changed in 2010 with organic products showing notable increases in sales again, which can be related to the improvement of economic conditions in general. In 2010 prices rose considerably in the second half of the year after a lower harvest of many crops, so it is likely that the limiting factor for market growth could again be supply. Overall it is estimated that market development in 2010 across Europe resulted in single digit growth rate for sales values and a bigger growth rate for the sales volumes. For 2011 market actors expect ongoing mainly single-digit growth of the organic market in many countries. Organic farming is defined by EU law since the beginning of the 1990s with Council Regulation (EEC) No 2092/91. On July 20, 2007, the new organic regulation was published, ‘Council Regulation (EC) No 834/2007 of 28 June 2007 on organic production and labelling of organic products and repealing Regulation (EEC) No 2092/91’, which came into force on January 1, 2009. The regulation guarantees that terms such as “organic”, “bio” and “eco” are only used on food products that are produced according to the standards laid down in the regulation. One of the key developments of the European organic sector in 2010 was the launch of the new EU logo for organic products. Since July 1, 2010, the organic logo of the EU has been obligatory on all pre-packaged organic products that have been produced in all EU member states and meet the necessary standards. Regulation 1698/2005 on support for rural development by the European Agricultural Fund for Rural Development enables member states to support the conversion to and maintenance of organic farming. While most member states avail of this opportunity the level of support varies significantly (Pohl 2009; Schwarz, Nieberg, Sanders 2010). Many non-EU countries also provide similar support. Rural development programmes have enabled broader based support of the organic sector, for example investment in processing, training, marketing and promotion. Organic farming action plans provide a framework for integrating policies and measures in order to encourage organic sector development. Thus action plans serve as a strategic instrument for governments to achieve policy goals, particularly when multiple policy areas (such as agriculture, environment, and trade) and different levels of policy formulation are to be integrated (Schmid & al. 2008). According to a recent survey at least 26 countries or regions in Europe have an action plan (Gonzalvez 2011), many of them with quantitative targets. Austria for instance aimed to have 20 percent organic land by 2010. This goal was more or less achieved; the country had a 19.5 percent share of organic land in 2010. In 2004 the European Action Plan for Organic Food and Farming was launched2. The information campaign proposed in the plan started in July 2008. With this campaign, Action 1 – a multi-annual EUwide information and promotion campaign to inform consumers, public institutions’ canteens, schools and other key actors – is implemented. The campaign website3 offers a wide range of information on organic agriculture and numerous tools (pictures, flyers) to support the promotion of organic agriculture. Today, organic farming research is funded under national research programmes or national organic action plans, as well as through European projects. Even though no figures for all European countries are available, it is known that the funds of the eleven countries who are part of the ERA-Net project CORE Organic amounted to more than 60 million Euros annually in 2006 (Lange & al. 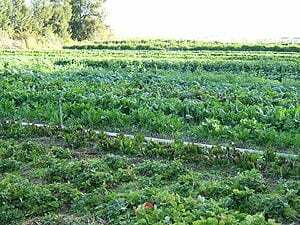 2006) Since the mid-1990s, several organic farming research projects have been funded under the framework programmes of the European Commission. Furthermore, there are several European projects that do not have organic farming as their focus, but carried out research related to organic farming in the framework of individual work packages.